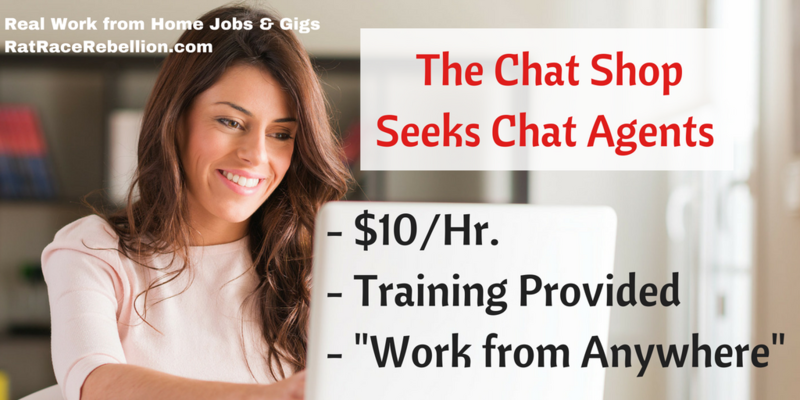 The Chat Shop is hiring Chat Agents for $10/hr., training provided. If you can speak fluent English, have a reliable Net connection and type well, check it out. The Chat Shop is a growing UK-based company whose clients include Mercedes-Benz and other large brands. Employee reviews give it 4.3 stars out of 5. It was founded in 2012 and has an international team. Get a $5 signup bonus and cash for surveys at iSurveyWorld. The hourly pay rate of $10 isn’t quoted on the site and hasn’t been confirmed by the company, but was recently mentioned in a post on Indeed. Chat Agents should be able to work 35-40 hours per week. This entry was posted in Work at Home Jobs and tagged The Chat Shop. Bookmark the permalink.